I'm in the middle of assembling these for my Mother's Christmas cards this year. I took the design almost exactly from the 2009/10 Stampin' Up! Idea Book and Catalog. It was the card that sold me on this versatile Christmas set. 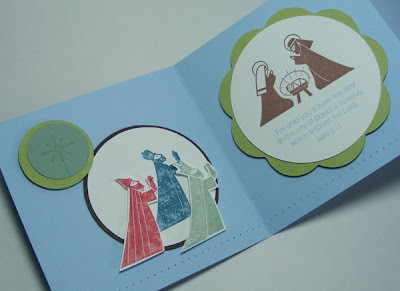 The card is 4" x 12" cut from Bashful Blue cardstock. First step was to 'sew' a row of holes 1/4" in from the bottom edge of the card. Just take the threads out of your sewing machine, set the stitching length, and sew. A 1/4" quilting foot is a big help to keep the line even. This is much faster than punching with the matt pad. I did get a little help from my Cricut. My circle cutting system is from Creative Memories. I've had it for years and love it. The only drawback is that while it cuts incrementally sized circles, it does skip a few sizes. In some cases with this card, it was those sizes I really needed. I used the Cricut to quickly cut the Chocolate Chip and red circles in the exact sizes needed. Stampin' Up! does sell a circle cutter that does incremental sizes. Also from Accent Essentials cartridge, I got a scalloped circle that mimics the one used on the Stampin' Up! card. I think they used small punched circles to create their custom scallop border. It is a pretty technique but a bit too time consuming for an already intricate card. The only color change was to add a little Not Quite Navy. With so many colors in this card already, I was hesitant to mix things up too much and upset the balance. I changed colors because the center Wise Man really needs to be done with markers and I didn't have the same color as the sample in a marker. 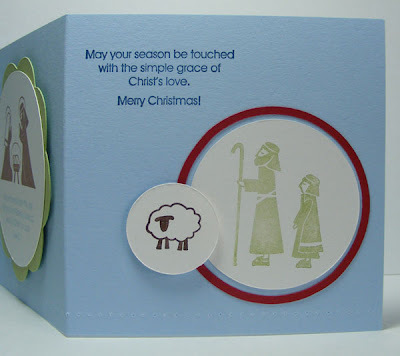 The other Wise Men can be inked and stamped with either markers or pads. Also there was a Certainly Celery button next to the star. I replaced this with a circle cut out of Certainly Celery and glued off center with the star. There are a lot of dimensionals used on the card and I plan to give Mother 5" square envelopes for mailing so the card won't be too crowded. Whew! There is a lot to this one but it is for Christmas so it is well worth it.